It is about the time he was first elected for Banbury in 1983 and given an opportunity to serve an area with a changed shape. Chipping Norton had become part of West Oxfordshire and Bicester was new to the constituency. The challenge was enormous. His predecessor Neil Marten had been MP for the Banbury constituency during a 24-year period and was a hard act to follow with a strong personal vote. In that time he contested seven elections. As his successor Tony had experienced the rough and tumble of the hustings four years earlier at Thurrock, Essex. The task was to get across a convincing message to the Banbury electors as he presented himself as publisher, company director and barrister. Completing the list of candidates were Brian Hodgson, further education lecturer (Labour); Keith Fitchett, accountant (SDP-Liberal Alliance); and David Brough, Banbury School student (Monster Raving Loony Party). Previous general elections had been dominated by considerable numbers of public meetings which brought the real threat of loss of voice power. 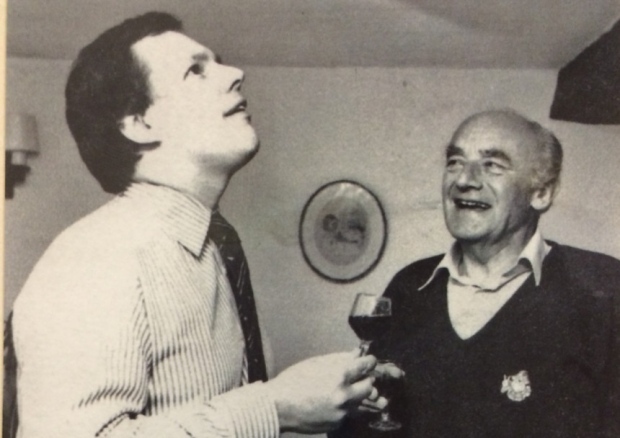 Fortunately for Tony – as illustrated in today’s picture – Neil Marten offered a solution, gargling with port. This got Tony through a challenging programme of public meetings. Tony’s response was positive. He gave them a set of Conservative election stickers printed in red. ‘Was this a printer’s error or was the supplier colour blind they asked’. The Labour Party’s tactics to counter a new Tory candidate was to bring in one of the big guns. The feeling was that Banbury had become a marginal seat and winnable. Their choice was Michael Foot and the Banbury Guardian’s response was a caption ‘Michael is betting on Banbury’. This was a reference to journalist Graham Wilton’s taunt ‘You’ll never win Banbury, Mr Foot!’ He and Michael Foot then agreed a bet on the election’s outcome. The prize was a Margaret Thatcher devalued 50p. A fascinating blow to Michael Foot’s confidence came when he was introduced to Dennis Adkins, fruit and vegetable trader in Banbury Market but also a strong Conservative supporter. While all this was happening Tony Baldry was set on ensuring that every library in the constituency had a copy of the Labour manifesto ‘New hope for Britain’. This was about nationalisation and the introduction of controls including the banning of field sports. Tony’s comment was ‘no wonder the programme has been dubbed “No hope for Britain” ’. An altogether more serious issue was the fact that Banbury was an unemployment black spot. Brian Hodgson went so far as to hang a banner outside Labour’s North Bar headquarters announcing that 3,530 were out of a job and Michael Foot made a much publicised stop at the centre for the unemployed in South Bar. Tony Baldry’s reply was to blame the ‘washing-up time’ strike at British Leyland, which was late delivering his new blue MG Maestro. He said that he was concerned about the threat to jobs in component manufacturing as at Automotive Products, Banbury. On the eve of poll Conservative meetings came thick and fast, three in Banbury, and one in Bicester. Whether or not these captured hearts and minds, Tony got home with a 13,025 majority. He polled 26,225 with Alliance second on 13,200, Labour in third place attracting 9,343 votes and 383 supporting the Loony Party. In the words of the Banbury Guardian ‘the four-week hullabaloo of the hustings is hushed’. There can be no better tribute to Sir Tony Baldry than the postscript on Sir Neil Marten by Gerry Steer of Tredis Guest House. ‘During the many years he has served us he has been a first class constituency MP, always willing to help and always willing to listen’.